Since 2006, Landmarks Illinois has honored individuals, families and corporations at its annual fundraiser, the Legendary Landmarks Celebration. This year’s event will be held Thursday, March 7, 2019 at the Hilton Chicago, 720 S. Michigan Ave. Landmarks Illinois is honoring Wintrust and Murphy Development Group as 2019 Corporate Legendary Landmarks and civic leaders Judith & Raymond McCaskey as 2019 Legendary Landmarks. "Landmarks Illinois carefully curates honorees named Legendary Landmarks based on the significance and longevity of the designee's cultural, philanthropic and corporate contributions to Chicago and beyond," said Bonnie McDonald, Landmarks Illinois President & CEO. "Our 2019 Legendary Landmarks have personal and meaningful connections to historic preservation among their many stellar achievements, and we are proud to illuminate these individuals and corporations as Legendary Landmarks." Landmarks Illinois is a membership-based nonprofit organization advocating for the preservation and reuse of historic and architecturally significant properties throughout the state. 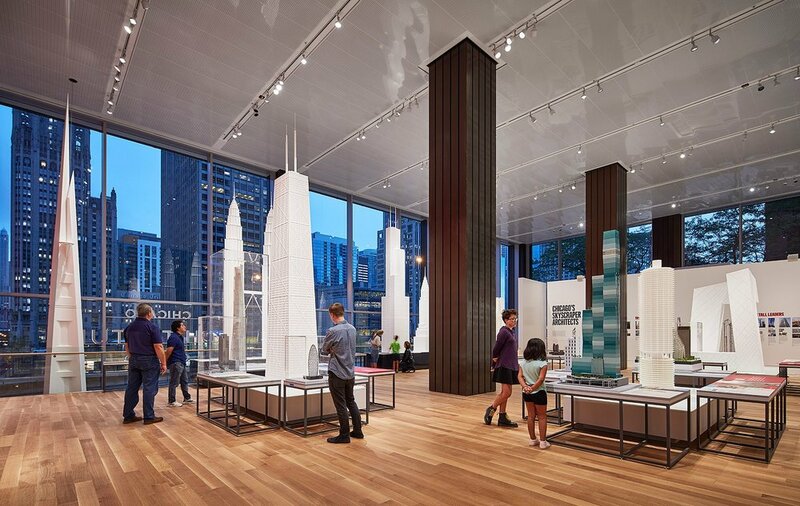 The Chicago Architecture Center, formerly the Chicago Architecture Foundation, has had a very busy month. Just before Labor Day, doors opened on its new location at 111 East Wacker Drive, a building designed by Ludwig Mies van der Rohe. As reported by The Architects Newspaper the Center’s spaces are designed to expand and contract with current and future exhibits. Shortly after the opening, they announced the neighborhoods and sites for next month’s Open House Chicago - a free public festival on October 13/14, 2018 that offers behind-the-scenes access to more than 250 buildings across Chicago. Now in its eighth year, the event will include the Chicago neighborhoods of Beverly, Morgan Park and Austin for the first time. The Chicago Tribune’s Blair Kamin offered his list of the 10 must-see buildings including Lake Point Tower, the Wintrust Bank Building at 231 S. LaSalle, and Frank Lloyd Wright’s Home and Studio in Oak Park. Open House Chicago is a great opportunity to learn the stories of Chicago’s buildings and experience the rich and diverse cultures of our community. February is Black History Month, an annual observance in the United States and Canada to honor the important accomplishments of black individuals in every area of endeavor. As the month gets underway, I wanted to share a story that was featured in FastCoDesign about the life and legacy of architect Paul Revere Williams (1894-1980). He practiced largely in Southern California and designed the homes of numerous celebrities, including Frank Sinatra, Lucille Ball and Desi Arnaz, Barbara Stanwyck and others. He also designed many public and private buildings - including the famous Theme Building at Los Angeles International Airport. The articles says that Williams designed over 2,000 buildings during his career. While he was known for his Hollywood mansions, he also designed affordable housing, conceptual transportation systems, experimental structural systems, and more. "Expensive homes are my business and social housing is my hobby," Williams once said. This year, Williams was posthumously honored with the American Institute of Architects (AIA) Gold Medal. “Our profession desperately needs more architects like Paul Williams,” wrote William J. Bates, FAIA, in his support of William’s nomination for the AIA Gold Medal. “His pioneering career has encouraged others to cross a chasm of historic biases. I can’t think of another architect whose work embodies the spirit of the Gold Medal better. His recognition demonstrates a significant shift in the equity for the profession and the institute.” The article by Diana Budds is worth your time and may be found here. At an event last week, Chicago Mayor Rahm Emanuel and Chicago Architecture Biennial officials named Los Angeles-based architects Sharon Johnston and Mark Lee of Johnston Marklee artistic directors of the 2017 event. The event's theme will be “Make New History,” and, according to the curators, focus on the relationship between modernity and history, and the relationship between art and architecture. Of critical importance in architectural discussion today is the renewed role that history plays in its making. One of the most dramatic ruptures in the evolution of architecture over the last century has been the fissure between history and modernity. The insistence on being unprecedented and unrelated to architectures of the past reached new heights at the beginning of the millennium, as more and more architects became reluctant to consider what they do as being part of a larger collective project or part of a longer architectural history. Last year’s biennial, themed “The State of the Art of Architecture,” was largely a broad-based survey of contemporary architecture and emerging designers. Johnston and Lee have chosen to narrow the focus. The Chicago Architecture Biennial seeks to convene the world’s leading practitioners, theorists, and commentators in the field of architecture and urbanism to explore, debate, and demonstrate the significance of architecture to contemporary society. For updates about 2017 and for more information, please visit their website.